Special technologies that are used by NASA tell us that our moon has a core, which is similar to our planet's structure. This is a very significant moment. 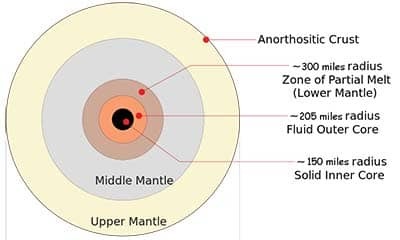 Revealing all the facts about the Moon's core, it would be easier to understand all the formations of this body amongst stars. The information acquired by Apollo-era gave a lot about the evolution of the moon dynamo. It reveals the secrets of creation and maintenance of Moon's magnetic fields. This information showed that it has a core-like structure. It gave a sufficient push for discovering multiple secrets of the moon. The findings showed that this heavenly body has a firm inner core, which contains a lot of iron. Its radius is 150 miles of solid iron. 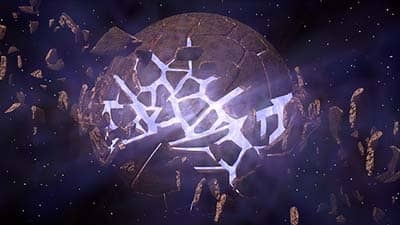 In the meanwhile, its outer core consists of liquid iron and has a radius of 205 miles. It differs from our planet due to a molten boundary layer. The radius reaches 300 miles. It also has a low concentration of sulfur and some other light elements. For instance, our planet's core also contains such light elements as sulfur, oxygen and some other. This makes both bodies related to one another to some distinct extent (by space.com). Apollo information was gathered during special expeditions in the years between 1969 and 1972. They recorded all the changes in the seismic activity of the moon until 1977. This gave more facts concerning similarities of both heavenly bodies. 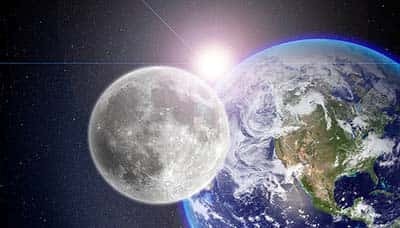 The leader of this very research Renee Weber told that the previous data has been combined with more recent information about the core of the moon. The scientists introduced novice technologies and put to usage different methodologies to receive maximal results. The scientist did not want to miss a single detail. The studies involved many experts from different agencies and universities. They published all the results in an online version about Space Science so that everyone eager could have a possibility to learn this interesting information. The scientists also involved array processing. This is an essential seismogram, which helps to define and figure out signals of quakes on the moon and other sorts of the seismic activity. It gave an excellent possibility to determine the place of the beginning of all seismic changes. The scientists were able to find all the reflection of this activity and identify all the happenings in different areas of the moon and its surfaces. The satellite image missions are a bit sophisticated. Nevertheless, that made great contributions to this intriguing study, which is of great importance. Previously, there were no real facts and proofs concerning the structure of the moon. In fact, even the structure of the Earth was under great doubts. These missions shed more light on this matter. The scientists had multiple debates and disagreements about many essential things. All the misunderstandings and disagreements were managed thanks to these very missions. Primarily, all the studies of lunar seismic activity were based upon the wash of "noise". It was induced by overlapping signals that bounced repeatedly off the surfaces of the moon in different parts. The scientists introduced a special approach, which was called "seismogram stacking". This method greatly benefited the whole study, as well as many other similar types of research. It tracked the whole path of the signals and detected their behavior. The Weber's team is content with the results acquired with the assistance of Appolo. The scientists are going to continue working with this technology and wish to implement some novice methods. This promises to be utterly perspective and may give a lot of new interesting discoveries. The future gives more hopes for new facts about mood and the next NASA missions will find out more details. There are multiple perspective projects will be started this year, as well as in the upcoming years. For instance, the NASA specialists will send twin spacecraft, which will hang around the moon for several months to measure the gravity of this body and various seismic changes. This mission will also answer many other questions concerning the similarity of Earth and moon. A special monitoring around the moon will provide the scientists with important geographic details. This might even begin a novel era in the topography of space bodies. This project has an international recognition. Many other countries wish to participate in it. This adds more chances for finding out more peculiarities of moon structure. More data is going to appear and it has tremendous potential for the future experiments. Apollo 11 consisted of the astronauts that have been in a space before and were very professional. 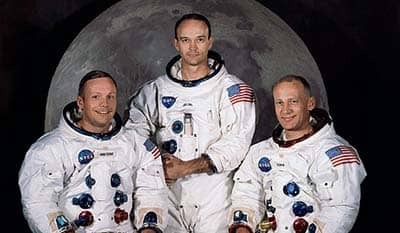 Every astronaut out of three had been in space before the Apollo 11 mission.